The Thrift Savings Plan – also referred to as the TSP – is the U.S. Government’s version of the better-known 401(k) Plan. This program has become one of the primary financial retirement tools for military members, who should be quite familiar with the program. The TSP was established by Congress in the Federal Employees' Retirement System Act of 1986. At that time, Military Members were not allowed to participate in the program – only federal civilian employees were permitted to participate. This changed in late 2002 when Military Members were permitted to begin participating in the TSP. The present format we know today – using shares and share prices - began in July, 2003. Then, in May 2012, the Roth TSP Option was added. As of August, 2017, the TSP had 5 million participants and $500 Billion of Assets Under Management, making it the largest defined contribution benefit plan in the world. The Federal Retirement Thrift Investment Board is charged with administration and oversight of the program. BlackRock – the well-known Investment Manager – acts as the “record keeper” for the TSP. As a member of the military, you are permitted to participate in the TSP. Using the Defense Finance and Accounting Service (DFAS) myPay website, you make contribution elections as a percentage of Base, Bonus, Special, and Incentive Pays – though NOT any of your allowances. You may decide to make these elections either Traditional or Roth and also how you would like them invested. The TSP program takes it from there: DFAS sends the money to the TSP Program, which then purchases shares according to your wishes in your account. Statements are sent quarterly. For those who participate, you may contribute up to the Internal Revenue Code (for 2018) limit of $18,500. For those over 50, you are permitted an additional $6,000 “Catch-Up” contribution, which brings your maximum deferral to $24,500 for 2018. 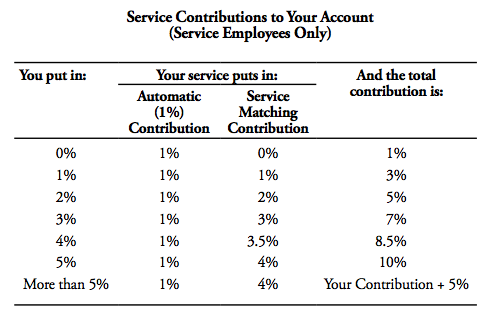 Of note, for those who contribute percentages of pay and are concerned about exceeding the $18,500 (or $24,500) limit, the software will not allow contributions beyond that amount. For new (as of January 1, 2018) military members and those who have opted-in to the BRS, you have the opportunity to receive matching contributions on up to your first 4% of deferrals to the TSP. Under the BRS, you automatically receive 1% of your Base Pay to your TSP Account. Then for each 1% of Basic Pay you contribute up to 3%, the Government matched the same 1%. For the next 2%, the Government matched 1/2%. The chart below depicts the matching rates. Simply put, there are very few opportunities in life where you will earn an immediate 100% return on your money, which is effectively what matching funds are. So, when the opportunity happens upon you, you should seize it!!! If you are eligible for matching contributions, your first retirement savings should go towards the TSP to realize these matching contributions. If you elect a Traditional TSP Contribution, you will receive a current year tax benefit. Meaning, if your nominal Military Pay is $50,000 and you elect to contribute $5,000 to the TSP, you will be taxed as if you only made $45,000 this year. Moreover, your TSP account will enjoy tax-deferred growth until funds are withdrawn. Upon withdrawal, all funds are treated as regular income for Income Tax purposes. Of note, TSP withdrawals also count 100% in “Provisional Income” for Social Security Tax Calculations. With Roth TSP Contributions, you receive no Current Year tax benefit. Meaning, if you earned $50,000 and contributed the same $5,000 to the TSP, you are still taxed on your full $50,000 salary. However, and this is a big deal, your $5,000 will enjoy tax-free growth until funds are withdrawn. BUT, when funds are withdrawn, all the funds are income tax-free. For those who serve in a designated combat zone, your income is Income Tax Free. Of note, you will still owe Social Security (6.2%) and Medicare (1.45%) Payroll Tax on your base pay. If you contribute Tax-Exempt money to the Traditional TSP, the earnings on these contributions are NOT tax-free. Therefore, if you make TSP contributions while in a Combat Zone, make Roth TSP Contributions. That way, the money is earmarked as “Roth” in your TSP Account. And more importantly, the earnings on the Roth Contribution will be tax-free. Conversely, if you absolutely need the tax benefit of the TSP Contributions, make the contributions in those months where you are not receiving Combat Zone pay. The G Fund is a special investment offering where you essentially earn longer-term rates of fixed-income, government bond returns with only short-term investment risk. This unusual offering is unique to the TSP and represents a very compelling fixed-income holding for a portfolio. The F Fund is a general bond fund index made up of a broad array of fixed-income securities. The C Fund replicates the S&P 500 Index - a group of 500 of the largest companies in the United States. This is the most common benchmark against which other equity investments are measured. The S Fund represents the relatively smaller capitalization companies in the United States. The I Fund replicates an Index of Foreign Companies. All of the offerings are standard Index offerings one would find in most portfolios used by investment professionals. As for expenses, the TSP enjoys exceptionally low operating costs - only $3.30 for each $10,000 invested...a very good bargain. Loan from your TSP Account are permitted. The amount is limited to the lesser of $50,000 or 50% of your TSP balance. The Loan will have a term of between 1 to 5 years for general purpose loans or 15 years for residential loans. It is important to understand that you are borrowing your own money and paying yourself back that amount plus the prevailing ‘G Fund’ Interest Rate. Repayment is not optional with payments beginning no later than 60 days after you receive the loan funds. Additionally, if you leave Federal Service, you only have 90 days to repay the loan balance in-full plus accrued interest. Otherwise, the Loan will be deemed a distribution and you will owe Income Tax on the entire distribution plus a penalty. Simply put, borrowing from your TSP Funds is generally inadvisable, even for a home and especially if you are borrowing for a down payment. I have heard many different rationales for borrowing from one’s TSP Account – the would-be borrowers were sincere, their desires for the money innocent, and their intentions of repaying the money legitimate. In almost every case I have seen, the TSP borrower regretted the decision after the fact. So please think through all the repercussions before borrowing from your TSP. If in doubt, talk to a Financial Professional about it!!!!! “Hardship Withdrawals” are permitted from the TSP. Many caveats and rules surround Hardship Withdrawals. Due to space limitations, I will not describe them in-detail. For more information, please look here. Move assets to either an IRA or to a subsequent employer’s 401(k) Plan, assuming the new plan accepts transfers – not all do. If you choose to receive non-annuity payments from a Traditional TSP Account, the funds received are treated as regular income. If you are younger than 59 ½, you will also owe a 10% Penalty for the early withdrawal. If you are considering an early withdrawal, please consult with a tax professional so you fully understand the impact of your decision. If you choose to transfer assets to an IRA or to another employer-provided 401(k), there are no income tax consequences for the transaction. For this type of transfer, a Trustee-to-Trustee transfer is recommended to avoid any chance of triggering any sort of income tax consequences. For married individuals, spousal consent is required to transfer funds. How much of your account balance you wish to commit towards the annuity. Suffice it to say, explaining all these options here would result in an exceptionally lengthy document. Therefore, if you are considering the Life Annuity option for your TSP Funds, weigh ALL the options carefully. And if you are confused at all, speak to a Financial Professional who can help you iron out any difficulties. The TSP is an exceptionally well-run program, period. The Investment Options within the TSP, while few in number, represent very broad coverage of much of the investment universe. Moreover, the Lifecycle Funds provide true "one choice" investments for participants. The TSP's cost advantage has eroded as expense ratios fall ever lower. For example, the S&P 500 ETF 'VOO' has an expense ratio of $4 per $10,000 - only 70 cents more per $10,000 than the C Fund...a very modest difference. Given the Military's Shift to the Blended Retirement System, a Military Member's understanding of the program is ever more important. While wonderful for accumulation, the TSP is sometimes not ideal for Withdrawal Options. For example, conversion from your Traditional to Roth TSP funds are not permitted as they are with IRAs. This is a huge deal for Military Retirees who have not yet started receiving Social Security Benefits and want to convert Traditional Funds to Roth Funds. Given the importance of saving for retirement, every military member should be aware of the TSP, the benefits of investing in the program, and understand eligibility requirements for receiving matching funds. Finally, and I cannot say this enough, please think very carefully before taking a TSP Loan - the typical result when doing so is regret....and a lower account balance at retirement.